PLUS 232 subtraction combinations up to 20-20. Each card asks the question – ‘Is this correct?’. Children place each card in the correct ‘yes’ or ‘no’ pile. There is no need to use all cards at a time. Just use certain number cards for a particular number focus or child level. 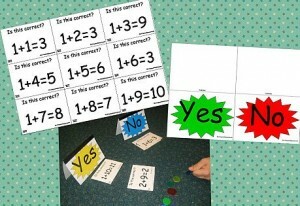 The cards could also be used over several groups of children making use of more than one set of yes/no stand up cards. ****Fantastic for use as a whole class game. Hand a card out to each child. Children then have to form 2 groups according to their card. The ‘yes’ group and the ‘no’ group. Now check the answers as a class. 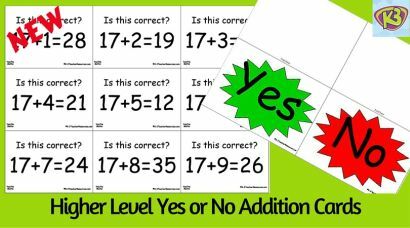 ****Have children make up their own addition / subtraction cards using the spare blank cards pages – 5 with correct answers, 5 with incorrect answers, to give to a partner to categorise into yes or no. After the children have completed placing the cards in the correct category (yes or no), they take all the cards under the ‘no’ category, and write out the equations using the correct answers. Discuss why some of the cards could not be correct. For example, 7+2 could not =3 because the answer must be larger than 7 etc….talk about strategies for addition sums – eg. counting on. Depending on the level of your children, have counters at the ready for children to use to check the answers.